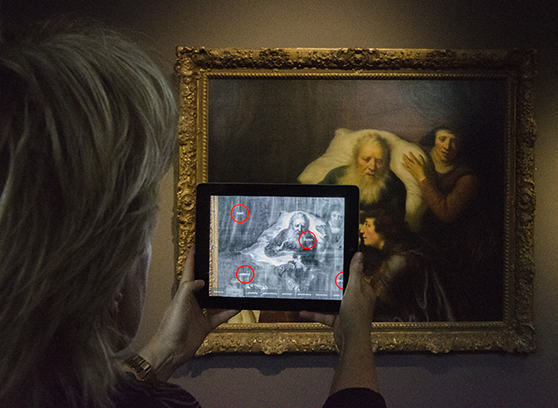 ‘Mapping Flinck’ builds upon The Augmented Painting, Phase 3 and utilizes the painting as an augmented reality marker. An iPad, which is mounted on a flexible arm, augments the painting with animations and spoken text. The installation was presented at Museum Catharijneconvent (Utrecht, The Netherlands) on 16-05-2013 and is currently still on display. The Cultural Heritage Agency of the Netherlands (Rijksdienst voor Cultureel Erfgoed – RCE) invited us to develop an installation based on the painting ‘Isaac Blessing Jacob’ by Govert Flinck on show in the Museum Catharijneconvent. This way we aim to make technological research about art accessible in a playful way and for a broad audience. Building upon our work for the Van Gogh Museum, we will create an installation which offers visitors to the museum a playful way to interact with this scientific data. In this project we will work together with Museum Catharijneconvent in Utrecht where the painting is on display, and the Cutural Heritage Agency.